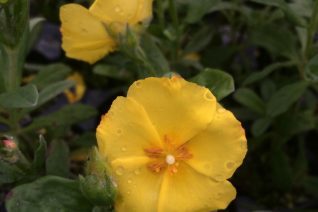 Nice, upright golden rockrose with felted gray foliage and masses of flowers from May-July. To 3′ x 3′ in full sun and well drained soil of average fertility. Little to no summer water once established. The simple, silky, egg yolk yellow flowers shine for most of the day before dropping in late afternoon. They drop all at once- which is kind of cool. A massive new set of buds will be waiting for daily displays for weeks. Good cold hardiness unless soil in too enriched. Grow this baby mean and lean and you get better performance, a longer lifespan, and better cold hardiness. Hell strips, dry borders, gravel gardens. Light deer resistance. Average lifespan 5-7 years- longer with neglect. Prune after flowering has ended if needed. Excellent shrub for a new garden while you wait for focal plants to establish. Big spreading Halimium with arching furry gray stems lined with furry gray foliage. 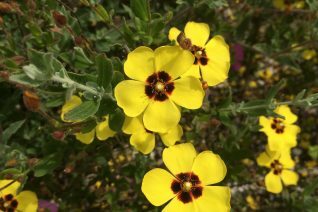 In May-July profuse 1″ wide silky yellow flowers with a basal blotch of deep brown appear massively each day. During the heaviest of bloom the foliage is completely obscured. Flowers last until about 4:00 pm and then the petals drop dramatically all at the same time. Full sun and average to poor soil with little summer water once established. One of the hardiest and easiest to grow. To 3′ x 6′ in just a few years. Very drought tolerant. Tolerates clay soils on a slope. Moderate deer resistance. The very best cultivar of Halmiums as judged by quantity and length of bloom. 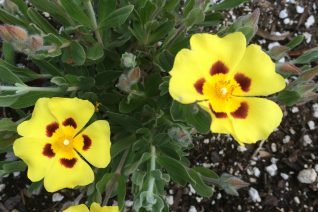 Golden yellow silky flowers have a deep maroon blotch at the base of each petal. Evergray, rounded shrub to 3′ x3′ in 5 years. Full sun and poor to average, well drained soil. Light summer water to establish then very little. Blooms for an extended period from early May to early July. Prune after flowering to encourage a denser form and more flowering wood. Excellent wildflower display that pairs well with blue flowered plants. Ceanothus thyrsiflorus ‘Victoria’ flowers simultaneously and appreciates the same cultural conditions. Moderate deer resistance. Average lifespan 6-8 years. 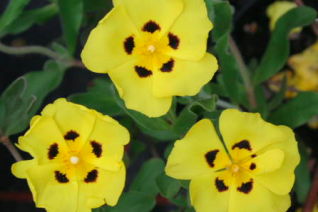 Golden rockrose (Halmium) is the other genus apart from Cistus. This dense rounded shrub to 2′ x 3′ is clad in evergray foliage and appreciates average, well drained soil in full, all day sun. Water to establish then only light occasional summer water. 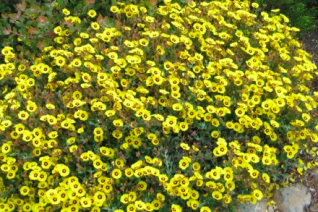 Blooms which are bright yellow and silky have a central zone of burgundy. One of the common monikers is ‘Black Eyed Susan Shrub’. Produces a great wildflower display for weeks in May to July. Lifespan is about 5-7 years but flowering is so profuse and long the risk is worth it. Cold hardy to 5ºF. Mediterranean native. Plant with Cistus, Grevilleas, Arctostaphylos, Pacific Coast Iris. Prune lightly after blooming has ended to shape, encourage a denser habit. 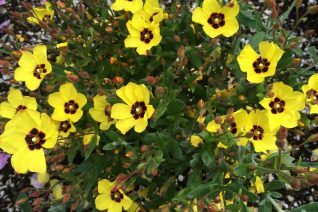 Gray spreading upright evergreen shrub that celebrates late spring into summer with profuse 2″ wide bright yellow silky flowers with a conspicuous tomato red blotch at the base of each petal. Each flower lasts but a day but there is such a profusion of blooms waiting in the wings that they occur daily for 4-6 weeks from May to July. To 3′ tall and 4′ wide quickly in poor to average well drained soil. Water to establish then water lightly and infrequently during summer. Excellent performance in Hellstrips. Blooms simultaneously with Ceanothus ‘Victoria’ the blue and yellow blossoms a classic combination and both shrubs appreciate the same culture. Cold hardy to 5ºF.